I was just looking at my Applications folder that contains hundreds of apps and realized that there are a lot of old things in there that I never used. I came up with the clever idea to sort my applications by the date they were last opened so that I could toss out old apps. (I figured that if I hadn’t touched something in the last two years I wasn’t likely to.) I’m running Snow Leopard and the problem is that when I open my Applications folder and choose View -> View Options, the option to view files by Last Opened is grayed out. Is there some way to make it active? You’re correct, Apple disabled that option in Snow Leopard. I’ve attempted to edit the com.apple.finder.plist file in order to make it active with no luck (though you can edit this file to enable other view options). But where there’s a will (or, at least, a Chris), there’s a way. The list below should contain only those applications that you haven’t opened in the last two years. If you don’t see a Last Opened column in this window, press Command-J to bring up the view options window and enable the Last Opened option (which, in this case, does work). With this column visible you can then sort the list by date, making it easy to locate those applications that you really, really haven’t used lately. Naturally, before tossing out these less-favored applications you’ll want to examine them carefully so that you don’t discard something that you anticipate needing some day. 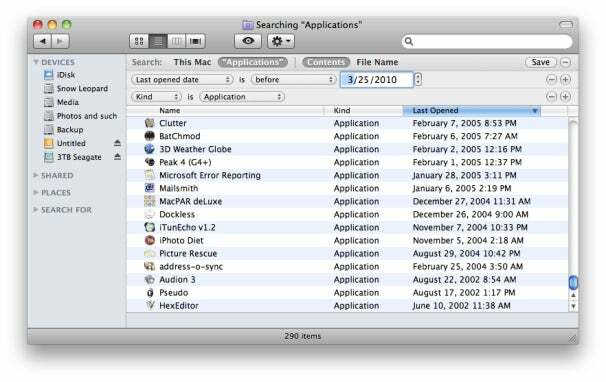 Note that if you’re running Lion, this isn’t an issue as Date Last Opened is enabled in view options.